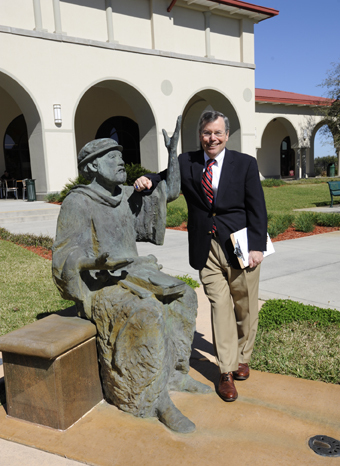 Rachel Carson Council’s President, Dr. Bob Musil, made his first campus visit on behalf of the RCC to St. Leo University in St. Leo, Florida as a Woodrow Wilson Visiting Fellow. Bob spent a week giving public lectures, teaching classes including health sciences, environment, ethics, and English, and meeting with student groups, faculty, and administrators. Over 50 faculty and students joined the Rachel Carson Campus Network as key contacts and e-mail activists. The campus environmental organization, Students for Environmental Awareness (SEA), has been working to remove invasive species and restore campus and nearby ecosystems. It is now officially linked to the RCC. RCC’s Musil and St. Leo relaxing on campus. 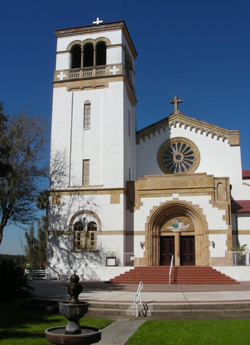 St. Leo is a Benedictine Roman Catholic university set amidst palms and palmettos, live oaks draped with Spanish moss, and nearby pines and pastures, lakes and streams, in developing countryside just north of Tampa. The campus has its own lake, resident Sandhill cranes, herons strolling to class, early spring warblers, an active Benedictine monastery, and a tradition of caring about social justice and the environment. President Arthur Kirk has grown the campus, its endowment, and its reputation while paying attention to the environment. St. Leo has a thriving Donald R. Tapia School of Business featuring a stunning new LEEDS-certified Gold building, while the cafeteria is trayless, and offers local foods. Like many campuses outside liberal enclaves in the Northeast and West Coast, St. Leo’s has just begun to move in sustainable directions. The university has not signed national agreements for climate commitments or joined sustainability associations like the Association for the Advancement of Sustainability in Higher Education (AASHE). But environmental awareness is growing and commitment to learning and doing more about it is widespread.